The Esperanza Hills/ project proposes approximately 340 units on over 469 acres. 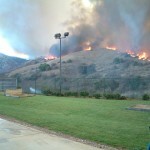 Esperanza Hills includes one daily access via a smaller “Bridge to Stonehaven” as the sole access point for the project. An emergency access (for fire apparatus) is proposed to Via del Agua (a third of a mile from the main entrance). 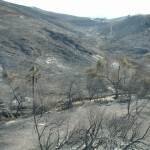 The November 2008 Freeway Complex Fire burned this site down in 40 minutes. This project is side-by-side with Cielo Vista adds 420 houses one one daily access for each project on the Stonehaven/Via del Agua loop. The Judge upheld the October 2018 lawsuit on January 11, 2019 even though the County and developer claimed it couldn’t not proceed. POHAH filed another lawsuit on October 25, 2018 on the project approvals. The Judge ruled December 21, 2018 the developer and County complied with the Writ of Mandate. The Orange County Board of Supervisors approved the project on September 25, 2018 with Supervisor Spitzer as the only no vote. The Orange County Planning Commission held a Public Hearing on the project on August 22, 2018. The Superior Court judge required the project approvals be overturned and the Environmental Impact Report be decertified by August 1, 2018. The Board of Supervisors complied with this court order on July 31, 2018. The 4th District Court of Appeals ruled in POHAH’s favor on three of the four key issues (water use, fire evacuation, and project description) on October 13, 2017. POHAH appealed the Return of the Writ decision on November 30, 2017 and we are awaiting a trial date. Judge Claster sided in favor of the County on the Return of the Writ in October 2017. POHAH filed a lawsuit in Superior Court against the County of Orange and developer on June 9, 2017. The County Board of Supervisors voted 4-1 (Supervisor Spitzer the dissenting vote) to approve the project on May 9, 2017. The County Board of Supervisors recommended the project go back to the Planning Commission for a secondary daily access on the western side of the project (to Aspen) and rescinded all project approvals on December 13, 2016. The revised Greenhouse Gas section has not be considered/certified by the Board. The developer proposed a primary access (500′ long Bridge) to Stonehaven and an emergency access only to Via del Agua. It was recommended for approval by the Orange County Planning Commission and Subdivision Committee in November 9 and 16, 2016 (respectively). Protect Our Homes and Hills won the lawsuit (on greenhouse gas emissions and deferred mitigation) in June 2016. The Judge ordered the project approvals, specific plan, and environmental documents all be rescinded. 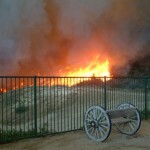 The Yorba Linda City Council has yet to certify the Environmental Impact Report for the Esperanza Hills project which violates state law and their duties as a responsible agency. POHAH filed a lawsuit in Superior Court against the County of Orange, City of Yorba Linda, and developer on July 2, 2015. The County Board of Supervisors approved the project’s General Plan Amendment, Zone Change and Specific Plan on June 2, 2015. The County Board of Supervisors approved the project’s Environmental Impact Report (EIR) on March 10, 2015. The Orange County Planning Commission recommended for approval the Esperanza Hills project at its January 14, 2015 hearing. The Notice of Public Hearing by the County for the Planning Commission though scheduled for Tuesday, December 17, 2014 at 1:30 PM was postponed due to a Brown Act violation. The Notice of Availability for the Final Environmental Impact Report was released December 5, 2014. The Draft Environmental Impact Report was released for public review December 3, 2013. This document and its appendices can be found on the County website. Comments were due February 3, 2014. 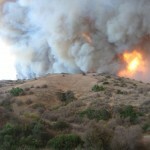 The Notice of Preparation for the Environmental Impact Report was released August 23, 2012. The City Council considered an appeal of the City’s Planning Commission decision that roads through open space/parkland are consistent with city documents at its January 5, 2016 meeting. This appeal was submitted by Protect Our Homes and Hills in November 2015. 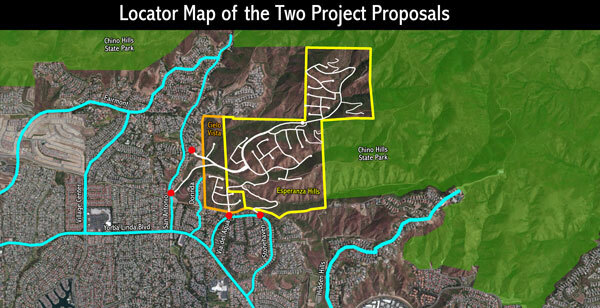 The City of Yorba Linda considered a pre-annexation agreement between the City and developer of the Esperanza Hills project, at its January 5, 2016 meeting. The decision was deferred. In addition to sending letters to the County on the Environmental Review process, we’ve also sent letters through our attorney Kevin Johnson to the City of Yorba Linda. Protect Our Homes and Hills also hired law firm Shute, Mihaly and Weinberger to assist with overturning the City’s decision on the pre-annexation agreement which allows a road through public open space and parkland. Our attorney on this endeavor, Gabe Ross, sent the following letter to the City.